With spring officially here and even warmer weather right around the corner, outdoor activities and fun in the sun are surely on your mind. But what about your loved ones in need – how can they enjoy spring and avoid being cooped up during this popular season? Try gardening: This low-impact activity has been shown to offer a wealth of health benefits to individuals, especially seniors. 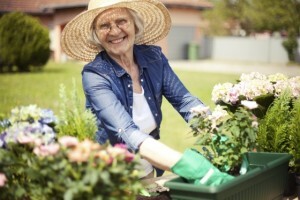 The National Diabetes Education Program lists it as one of the five ways older adults can be more physically active and for individuals with Alzheimer’s, gardening is a great way to connect with them that’s safe and secure. Because gardening can be a community activity, it’s a perfect pastime for caregivers to actively connect with their loved ones. Go for a walk: For older individuals or even those recovering from injuries, walking can be one of the most powerful springtime activities. The Arthritis Foundation cites numerous benefits of walking such as improved circulation, a 40 percent reduced risk for hip fractures, improved mood, healthier weight, stronger joints and diminished mental decline. Spring clean: Winter tends to result in accumulated gifts and clutter throughout the house. For in-home care recipients, now’s the time caregivers can lend a helping hand with spring cleaning. This not only keeps your loved ones active, it also creates a safer environment for seniors and in-need adults to move around the house. By taking your time and reminiscing over keepsakes, you and your loved ones can also turn spring cleaning into an enjoyable activity. Springtime is the perfect opportunity for families around the nation to do something different and energize their loved ones in need. We also understand that everyone needs a little assistance sometimes, which is why our highly-trained caregivers are available to help your loved ones enjoy all spring has to offer. To find out more, contact your local FirstLight Home Care today.